The answer is: (a qualified) C.
I qualify it because I’m sure you could find a tea bagger that isn’t a Republican (I’m talking to you Mr. Independent). You might even find a Democrat or two that is a tea bagger (in a political sense, of course). But, sweeping politics aside, basically, all Cognacs are brandies, while only a subset of brandy is Cognac. Armagnac is also a brandy, but it is produced in the Armagnac region instead of the Cognac region (it lies just south of Cognac). The word comes to us from the Dutch word for “burned wine” – Brandewijn. The Dutch discovered that if they distilled wine, they reduced the volume so they didn’t have to pay as much tax when they shipped it from place to place. Societies had been distilling wine since pre-Christ times, but the Dutch perfected the process to save some tariffs. They intended to turn it back somewhat into wine by adding water (and volume) at the final destination, but discovered that the product was good on its own (it developed character from the wooden barrels that it was transported in, much as a great Bourbon or Scotch gets its character from barrel aging). “Burned” came from the distillation process. Brandy is called Brandwein in Germany (“burned wine) and eau de vie in France. Kir is cherry brandy (not to be confused with Kir, the cocktail). Slivovitch comes from the Slavs and Metaxas comes from Greece (it’s a brandy hybrid, if you want to be precise). Some people even call Calvados ‘brandy” even though it’s an apple-based distilled spirit, instead of grape spirits. In fact, many brandies are adulterated after the fact by the maceration of various fruits, although Calvados replaces grapes with apples, while other brandies take the maceration route. Basically, you can consider brandy a distilled grape product. This means that grappa is technically a brandy as well. Think of Cognac and Armangac as brandies with pedigrees. Armangac is usually more “rustic” and rough-hewn than Cognac. This is due to a slightly different process and a different geographic influence. 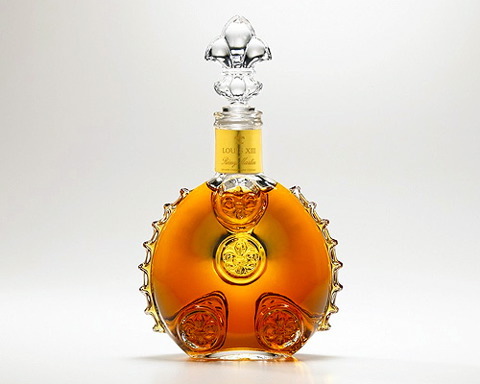 The famous Louis XIII from Rémy Martin. Nicknamed “Louis Trey”, it’s a blend of 1200 different Cognacs, aged from 40 to 100 years and offered up in a Baccarat crystal bottle worth $100. It’s traditional in restaurants that serve this precious liquid that the person who orders the last glass from the bottle gets the bottle as a gift. A single serving of this usually runs around $150, and the smart restaurant performs a bit of ceremony when they serve it. Yesterday’s quick tip was about being careful to reprint checks. I can hear some of you newbies ask, “Why would you have to reprint a check up to three times if you print a check right before dessert? Wouldn’t the most you would have to reprint it is one time, assuming that they got dessert”? Well, a good waiter never assumes that they’re finished. Yeah, yeah, I know that most of the time, you’re hoping that they’re going to leave quickly so that you can get another table. And it’s true, in the middle of the rush, sometimes rather than up-selling, you downplay dessert. However, there are plenty of times when the “dessert course” can mean a significantly bigger check, especially if you’re in a more upscale establishment (I know that most newbies won’t be in such a place, but you should still understand that there are times when what you sell post-entree can raise your check significantly). There have been times when I’ve asked before they order dessert whether they want coffee and they say no. Then I bring the dessert and halfway into dessert, they realize that they need coffee. So I ring up coffee (printing the check and discarding the previous check that I’ve already printed) and go get it for them. Then, because I had already previously asked them if they wanted Bailey’s with their coffee or port, one or two of them decides that Bailey’s would be nice when the coffee hits the table. So I bring the Bailey’s, having to reprint the check and discarding the old one while I do it. Then I get back to the table and someone decides that port would be nice. So the reprinting check thing happens again. And, as I think I’m finished for sure, two of them decide to cap off the meal with cognac. Of course, I don’t mind all of this grand desserting because they’re one of my later tables and the bill has just risen by an extra $60. When I get a table that starts doing this, I get back into the selling mode, even if it’s in the middle of a rush, depending on how I’ve read the table during the meal. That’s because, in my current restaurant, you never know where it’s going to end. One of my fellow servers thought they were finished with a deuce when the two businessmen decided to have two glasses of Louis XIII, or as we like to call it in the business, Louis Trey. Those two glasses of cognac are $150 a piece. His deuce, an already nice deuce at $300, doubled instantly. And they never would have done it had he not suggested it and sold it as an experience, even though he thought they were through. He just had a feeling about them based on their demeanor and how they had been ordering through the meal and he rolled the dice. He never gave up on them. and he got a great $120 tip instead of a really nice $60 one. I realize that many of you don’t have those kind of selling opportunities. But most of you can upsell things like Bailey’s and Frangelico with coffee. This should be SOP for you. If a table has been drinking any type of alcohol, you should always solicit at least Bailey’s when you solicit coffee. It can mean an extra $20 on your check if you sell two or three of them. and hell, they’re going to have coffee anyway, right? Might as well make it a $10 coffee instead of a $3 one. Obviously, you don’t want to build your check by $20 and lose a turn, because that can cost you another $60 table. So you should be aware when you should and shouldn’t be somewhat aggressive about up-selling the dessert course. Just don’t get in the habit of automatically going into down-selling mode when you pick up the entree plates because you want to get them on their way so that you can get your next table. You just never know. Pick your times and places and then go for it. Don’t forget that a grand dessert finish to a meal will leave the guest with the ultimate dining experience and might very well be reflected in your tip percentage.